If you stand atop any highrise in Delhi's Connaught Place on a clear day and look towards the south east direction, the outline of a white lotus is silhouetted against the blue sky. An epiphany in marble, the Bahai house of worship has etched itself on the consciousness of the city's inhabitants — capturing their imagination, fuelling their curiosity, and revolutionising the concept of worship. Set among sprawling green lawns, the petals of this grand lotus are surrounded by nine pools that represent the floating leaves of the flower. 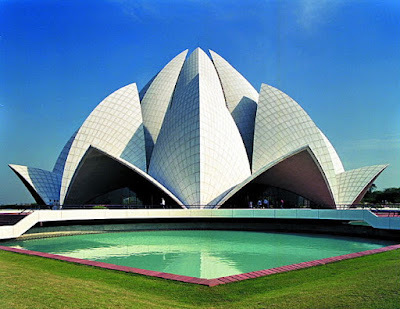 The interior dome is spherical and patterned after the innermost portion of the lotus flower. Light enters the hall in the same way as it passes through the inner folds of lotus petals. The interior dome is like a bud consisting of 27 petals. Light filters through these inner folds and is diffused throughout the hall. The central bud is held by nine open petals, each of which functions as a skylight. The nine entrance petals complete the design. External illumination is arranged to create the impression that the lotus is afloat on water. A spectacular combination of architecture, nature and culture, the Bahai house of worship combines the grandeur of a palace and the peace of a monastery. There are no priests, idols, pictures, sermons or rituals here. It is a place for communication between man and his God. The aura of silence surrounding the Prayer Hall instills reverence. Daily public services here include selections from the holy books of all religions. Few temples radiate the atmosphere of sublimity, peace, and calm so necessary to elevate a devotee spiritually as the Bahai House of Worship.